Every year the critics whip up a top list of films to look forward to. Some exceed expectations, some fall flat on their faces, and others get lost in the thousands of movies produced each year. Here’s a quick glimpse of future favorites – a top 5 list, submitted for your approval, of my most anticipated features. J.J. Abrams’ follow up to his surprising 2009 action hit looks to be a sure-thing at the box office, but on the critical side of the table it appears this film has the capability to blow the first entry out of the water. 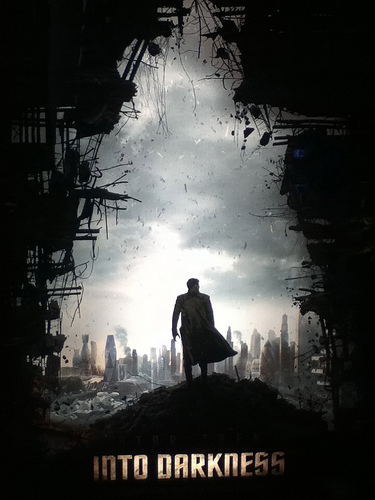 Chris Pine returns as Captain Kirk, heading the motley crew of the star ship Enterprise. Look for this one on May 17. 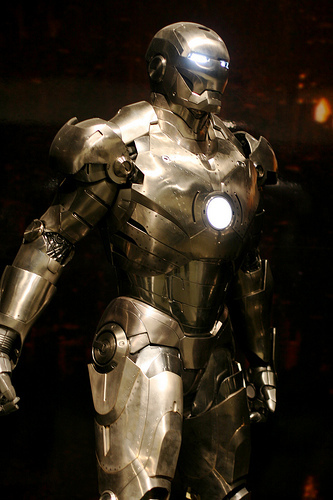 The original Iron Man caught the world by surprise in 2008, and almost single-handedly revitalized the superhero genre. Marvel’s newest entry promises to be the most entertaining yet, and let’s be honest – who doesn’t love Robert Downey Jr.’s cocky-yet-likeable Tony Stark? This one’s just a few weeks away, as it will be released May 3. 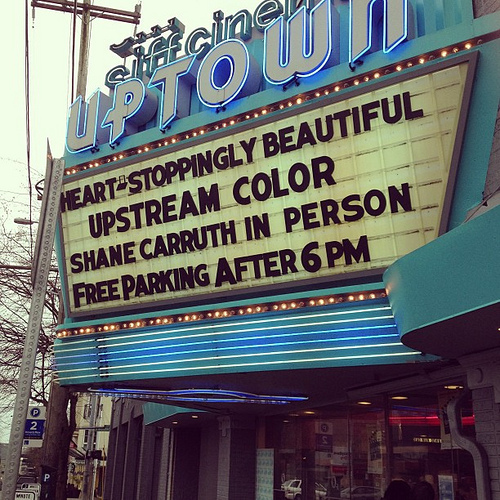 A Sundance favorite, Upstream Color is the sophomore effort of Shane Carruth, the director/star of 2004’s trippy time-traveler, Primer. This entry looks to be even more outlandish than the Carruth’s indie favorite, which is a good thing. I wish I could preview the movie and tell you what it’s about, but that would warrant an entire post itself. There’s no wide release, but you can find it online at certain retailers. Matt Damon, social commentary, and really, really big guns – what’s not to like? Neill Blomkamp follows his wildy successful District 9 with another sci-fi introspective, dealing with the 99-versus-1 percent debate that has been raging in political and economical spheres as of late. Elysium hits theaters August 9. What other film could possibly be the Movie Gent’s most anticipated film of 2013? Director and co-writer Baz Luhrmann (Romeo + Juliet, Moulin Rouge!) has made this classic Fitzgerald novel his own, and the preliminary results are stunning. The aesthetics look like my fantasy of the roaring 20’s, and with Leonardo DiCaprio at center stage with the lovely Carey Mulligan, I’m incredibly excited with how this movie could manifest itself on screen. Heads up – it’s coming out in just two weeks on May 10. A wise man once asked: “Why do we need heroes?” It’s a valid question. The most honest answer is simply this; It’s because we’re less than perfect. This question and its subsequent answer is as true in sports as it is anywhere in life. As I write this piece, I’m watching the ESPN 30 for 30 entry about Bo Jackson, one of the most mythical figures in the history of athletics. It occurred to me the other day that sports really can bring out the best in us. Our sweat, blood, and tears are spilled on whatever sporting surface we happen to be playing on as we dedicate our life to the games we love. Sportsmanship and comradery are alive in their truest forms. It’s an inherent truth that we all know, and nowhere is this more apparent than in ESPN’s groundbreaking 30 for 30 series. Wayne Gretzy, Michael Jordan, the 1984 SMU team – men and groups such as this have had their unique stories showcased in these segments, as ESPN delves into topics of the sports greats. But more importantly, this series shows us how those who are imperfect can achieve greatness in the face of such adversity. Individuals like Terry Fox and Dewey Bozella – ordinary people who did extraordinary things – now have a venue for their stories to be told. Sports film and documentaries will never be the same because of 30 for 30, and that’s a good thing. Every time I watch one of these entries, I’m inspired to be a better athlete, regardless of my level of play, and I hope everyone else feels the same way after watching just one of these brilliant productions from ESPN. You’ve got to like Robert Downey Jr. If there’s one thing I appreciate, it’s self-deprecating humor, especially from someone rich and famous. Enter Robert Downey Jr., in an interview with co-star Gwyneth Paltrow for the upcoming Iron Man 3. After going through a rough patch in his career during his mid-2000’s drug problems, RDJ rebounded by taking on the Tony Stark / Iron Man persona, a character that’s not too different from himself. It appears that like Mr. Stark, Downey Jr. too has learned to poke fun at his own inadequacies, as he discusses his cultural shortcomings on French television. Paltrow’s reaction is pretty fun by itself, so give it a watch – oh, and be on the lookout for newest Iron Man film, in theaters May 3. Still looking for a reason to watch Cloud Atlas? Look no further – this is the greatest five minute cinematic trailer I’ve ever experienced. Cloud Atlas is easily one of my favorite movies of all-time, and this teaser (and the quotes) most accurately explain why. Give it a try, and I hope you choose to watch the film. 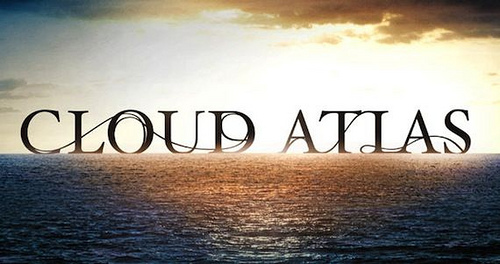 Cloud Atlas is not an easy movie to describe, nor is it an easy movie to watch. The official synopsis of the film is that it’s “an exploration of how the actions of individual lives impact one another in the past, present and future, as one soul is shaped from a killer into a hero, and an act of kindness ripples across centuries to inspire a revolution.” It is symphonic in the way that a complex concerto is, seamlessly intertwining each movement until the audience is left in an inspired awe, recounting the tale that was just told to them in a language they struggle to understand. Cloud Atlas’ beauty can only be enjoyed after the sum of the parts has been experienced, but in doing so, each part is not appreciated fully and the connection to its neighboring pieces is not completely apparent. On mere $102 million budget, this independent anthology was adapted from David Mitchell’s 2004 award-winning novel. Encompassing six separate plots spanning from the Pacific Ocean circa 1849 to an island on distant post-apocalyptic Earth is no easy objective, even with a run time of 172 minutes. So daunting a task was Atlas that acclaimed German director Tom Tykwer (Run Lola Run) employed the help of the Wachowski siblings (The Matrix). The team of directors filmed parallel to each other using separate camera crews, and A-list actors such Tom Hanks, Jim Broadbent, Halle Berry, and Hugo Weaving played leads in the multiple narratives. Each tale is played out in tandem, employing a sort of collage type of film making that I have never seen used before. Each time one story begins to draw you in, Atlas throws you into another time and place. Lines are often repeated in each narrative, and small things such as a pebble, a comet shaped birthmark, or a fleeting line of music help tie them together in a meaningful way. But because of the startling contrast of each story, these devices sometimes fail, and the viewer is left feeling detached from a movie that is trying so hard to be profound and unique that it occasionally misses the mark. Each timeline lacks in one way or another, be it direction, dialogue, or relevance to the plot – especially the farfetched post-apocalyptic sequence (the broken English, Hugo Weaving’s character, etc.). Connecting these deep stories is ultimately an impossible effort. Yet the cast and crew deserve praise for such a brilliant attempt that comes close to doing so. Like the haunting melody of the “Cloud Atlas Sextet” that is echoed throughout the years of the film, the connection between the narratives is like the ghost of a memory, something we know is there but can’t quite put our fingers on. The characters contribute to it, know it, and are shaped by it the same way that we the viewer are as we watch the events onscreen unfold – and that’s what makes Cloud Atlas one of the year’s best, as well as my favorite. Recently I wrote a review on The Twilight Zone, and why it was one of the most sensational shows that our generation has yet to rediscover. Because not enough people have been exposed to it, I found it fitting to write a quick list of the best episodes that the program has to offer. Hopefully, this can provide a starting point for those of you who are yet to become familiar with this classic anthology series from the mind of Rod Serling. Arguably the most famous episode of The Twilight Zone, “Time Enough At Last” has been parodied more times than one can count. Emmy winner Burgess Meredith plays a bookish man who wants nothing more than to read his piles of literature in peace, though the world around him makes it impossible. When the world does indeed end, his dreams become a reality. Of course, this being The Twilight Zone, he’d be getting off too easy if he were left happily to his novels. Though not my favorite, this particular episode showcases the archetypal Serling story: a long, intriguing buildup with a 180 degree twist in the last few minutes, which leaves the viewer to ponder on what could have been, what was, and just how plausible some of these seemingly insane situations really are. Not only does this episode contain one of the most ironic and slap-yourself-in-the-forehead, “I should have known it” twists, but it is a chalk full of meaningful quotes that stick with you after viewing. The delivery and acting can be sub par at times, but it doesn’t keep the vast majority from looking to this entry into Serling’s hit series as one of its brighter spots. This season two episode is unique in the fact that there is almost no dialogue throughout its run time, yet is still wholly captivating. Agnes Moorehead plays a poor, homely woman in a farmhouse, who hears a terrifying noise one night. Upon investigating, she finds a flying saucer has landed, and she is soon attacked by small figures. The twist is one that can be found in several Twilight Zone episodes, but it is strongest here, as we sympathize with this woman to the very end, and the ultimate reveal. Arguably the best episode of the fifth season, this classic has been parodied almost as much as “Time Enough At Last.” It might be that the only reason this episode has stuck with me is because it gave me (and my dad, which is a strange coincidence) nightmares as a child – how fitting, given the title. It stars a young William Shatner, who thinks he’s losing his marbles when he sees a gremlin of old German folklore tearing up the wing of the plane he is on. Is it real? Is he seeing things? That’s the question everyone’s asking as “Nightmare” reaches its final destination. A common vein in The Twilight Zone is tongue-in-cheek social commentary, something that the liberal-minded Serling accomplished with aplomb. Nowhere in his anthology series is it more easily and well executed than in “The Monsters Are Due on Maple Street.” Serling captures Cold War era America so perfectly that you can’t help but watch on as this socially-tinged short comes to a rather bleak close. The most impressive thing about this entry, however, is that it still holds up today – in post-9/11 America, and one can easily imagine an upper-middle class neighborhood whipped into a frenzy as they search for a scapegoat. 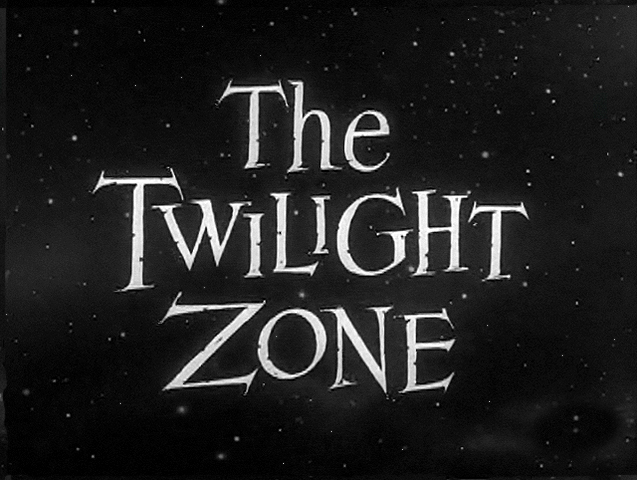 This chilling first season episode goes down as one of the most unsettling (and enjoyable) episodes of The Twilight Zone. The beautiful Ingar Stevens stars as Nan Adams, a young women taking a cross-country trip from New York to Los Angeles. After a flat tire interrupts her voyage, she begins to be plagued by visions of a most unusual sort: a hitch hiker, who rarely speaks but appears around almost every turn. As Nan begins to descend into insanity, the visions become more frequent and the tension more palpable. I won’t ruin the ending, but it’s one of the more satisfying and spine-tingling twists that Serling penned. While many of the episodes on this list involve the morbid, the creepy, and the downright strange, Serling’s groundbreaking series was effective not because of its frightening qualities, but because of the versatility of episodes such as this one. “Walking Distance” employs a simple premise, but one which connects with the viewer. Martin Sloan is an ad executive whose car has broken down just outside of his childhood town. The mechanic says it’s walking distance from the shop, so Sloan visits his old stomping grounds – with surprising results. This early entry from the first season is a rather touching one, and Serling proves that he doesn’t need scares to score a hit with his viewers. My personal favorite, this early episode is one of the first entries that I show to Twilight Zone newcomers. It stars Golden Globe-winner Anne Francis as Ms. Marsha White, a department mall shopper who is taken to the ninth floor in search of a gold thimble. Waited on by an unusual saleswoman, she finds what she is looking for, though she tries to return it to the manager when she finds it is dented. While arguing with the manager she finds the woman who waited on her… though she isn’t what she seems. Watching “The After Hours” was the point at which I decided that this series was my absolute favorite, and the twist ending is still as genuinely exciting and unexpected as it was in 1959. Another one of my favorites, “A Stop At Willoughby is employs the archetypal “man worn down by society,” a favorite of Serlings. Gart Williams is an ad executive who’s unappreciated by his boss, by his wife, and by the world at large. One snowy evening on the train home, Gart dreams of a place called Willoughby, a town “where a man can slow down and live his life full measure.” Gart eventually decides the next time he falls asleep that he’ll get off at Willoughby, leading to what is perhaps one of the most morbid (or is it?) episodes of The Twilight Zone. Like Gart, this entry is criminally undervalued, and a must-see. Though not my favorite, this episode best encapsulates what Serling wished to achieve with his masterpiece series. It opens with Janet Tyler, who has just undergone her eleventh surgery – the maximum allowed by the state – in order to become beautiful. The entire sequence is beautifully shot, as the hospital staff’s faces are shrouded in shadow for the entire run time. Janet’s face is hidden as well, and Serling relies heavily on the camera angles and cinematography to keep the viewer interested. Though the effects don’t quite live up to today’s make up and the twist is a little predictable, “Eye of the Beholder” still holds up as one of the finest examples of Serling’s commentary on society, insisting that our image of the “perfect person” is perhaps more relative than we believe. “Beholder” takes the top spot, and is perhaps the best example of what it means to be in… The Twilight Zone. Any time you’re picking a film to watch, several things go into account: Who are you with? What time of year is it? Is your movie taste any good? (I’d hope so). All of these factors are key when deciding how to spend a night in, and one what you’ll want to watch. Choose something fun! I have the issue of choosing a mind-bending psychological thriller, or a critically acclaimed drama when in reality, the masses usually just want to be entertained. A light-hearted comedy for a mixed group or an action blockbuster for the boys is always welcome. Go crazy with whatever you’re in the mood for. Be adventurous! Pick something you usually wouldn’t try, and see if you enjoy it. Netflix has a great selection on their instant watch page, and this link here has some great suggestions. Whether it’s a girlfriend or just someone you’re getting to know, it’s never easy picking the right movie. The best idea, like in any relationship, is to be open and talk about it. Ask what movies she’d be willing to watch. What is she in the mood for? What’s something she’s always wanted to see? The more honest you are with each other, the more you will enjoy your night together. Whatever you do, don’t watch something awkward that involves a business setting. Or something that’s suggestive towards a female co-worker – be tasteful. Why are you watching a movie with your parents? !